Great news for Samsung lovers, Samsung Galaxy S6 featuring 64-Bit Qualcomm Snapdragon 810, 5”inch qHD AMOLED display, 20-MP OIS Camera going to make it’s global debut on 1st of March 2015 at Galaxy Unpacked 2015 event along with curved display smartphone Samsung Galaxy S Edge. 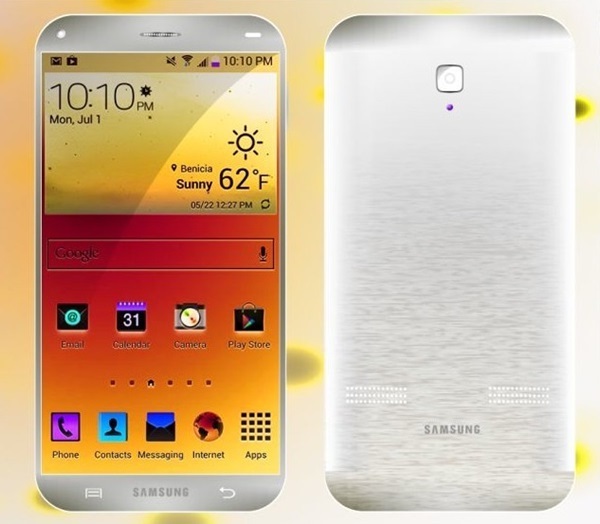 Samsung Galaxy S6 expected to cost you EUR 749 (approx. Rs. 52,500) for 32GB, EUR 849 (approx. Rs. 59,500) for 64GB, and EUR 949 (approx. Rs. 66,500) for 128GB. It will counter Apple iPhone 6 and iPhone 6 Plus and upcoming Sony Xperia Z4, HTC One M9. According Rumors, Samsung Galaxy S6 is a metal clad smartphone will support 4G LTE, NFC, Wi-Fi, Bluetooth, Finger Print scanner and heart rate sensor will offer you a 5”-inch qHD AMOLED display with 1440 x 2560 screen resolution with 554ppi while earlier reported that S6 will offer 3840×2160 resolution. Galaxy S6 will run on latest Android 5.0 Lollipop powered by a Qualcomm Snapdragon 810 / Exynos 7420 / UFS 2.0 NAND Flash memory with 32/64/128GB internal memory expandable up to 128GB Via MicroSD card slot. For shooting Galaxy S6 will offers you a 20-MP/16-MP Rear OIS camera and a 5-MP front camera expected to be powered by a powerful 37,00mAh battery with Ultra power saving mode. Rivals Apple iPhone 6 and iPhone 6 Plus and upcoming Sony Xperia Z4, HTC One M9. At last few honest word, upcoming Samsung Galaxy S6 is coming to rule the high-end smartphone market. What you think? Please be open to give your view and stay tuned to more updates.